At a celebration honouring the greatest Canadian innovations in health research, the Rx&D Health Research Foundation (HRF) has awarded its Medal of Honour to Dr. Robert Young and Dr. Charles Tator for their incredible achievements in Canadian health science and clinical and research work at a ceremony this evening. Dr. Young is credited for the discovery and development of Singulair, which changed the way asthma is treated. Dr. Tator is responsible for cutting-edge work in the field of brain and spinal cord injuries. "For their incredible achievements in healthcare research, which have impacted the lives of many Canadians in improving their health, I am honoured to bestow the Medal of Honour to Dr. Robert Young and Dr. Charles Tator for their vast contribution to research," said Mel Cappe, Chair of the HRF Board of Directors. "Their work and discoveries have helped people the world over more effectively manage chronic asthma as well as prevent needless brain injuries due to concussions." Dr. Robert Young was involved with the discovery and development of montelukast sodium (Singulair), used to prevent asthma attacks. He is a Professor of Chemistry and the Division Chair of Medicinal Chemistry at the Centre for Drug and Research Development, and has held the post as Merck Frosst BC Leadership Chair in Pharmaceutical Genomics in Drug Discovery at Simon Fraser University, after a 29-year career at Merck's research labs in Montreal. His career focused on the design and synthesis of novel drugs for asthma, inflammation, osteoporosis and related disorders and he has authored or co-authored over 100 publications and review articles and 50 patents. Dr. Young is a Member of the Order of Canada and a Fellow of the Royal Society of Canada. Dr. Charles Tator founded the "Think First Foundation" which is devoted to the prevention of brain and spinal cord injuries among Canada's children. He received the USA Hockey Excellence in Safety Award for his work on prevention of brain and spinal cord injuries in hockey as well as the lifetime achievement award from the American Spinal Injury Association. He developed the first acute spinal cord care unit in Canada and is currently exploring the possibility of transplantation of adult spinal cord derived stem/progenitor cells after experimental spinal cord injury. He has over 300 peer reviewed academic papers on spinal cord injury and repair and has trained over 30 research scientists in his laboratory over last two decades. The HRF Gala was held in partnership with Prix Galien Canada and Research Canada: An Alliance for Health Discovery. Research Canada presented their inaugural Leadership Award for health research advocacy to three recipients: the Centre for Addictions Research of British Columbia for the culture of advocacy within the organization that has impacted substance use policy locally, provincially, nationally and internationally; Dr. Michael Julius, Vice-President of Research at Sunnybrook Health Sciences Centre for his contribution of a brilliant conceptual model which broadened and enriched the health research policy dialogue among health research stakeholders; and Russell Williams, President of Rx&D for fostering successful partnerships and collaborative action in the health innovation sphere. The Prix Galien Canada 2014 Innovative Drug Product award was given to InterMune Canada for pirfenidone (Esbriet), which is the first medicine available to patients with idiopathic pulmonary fibrosis. 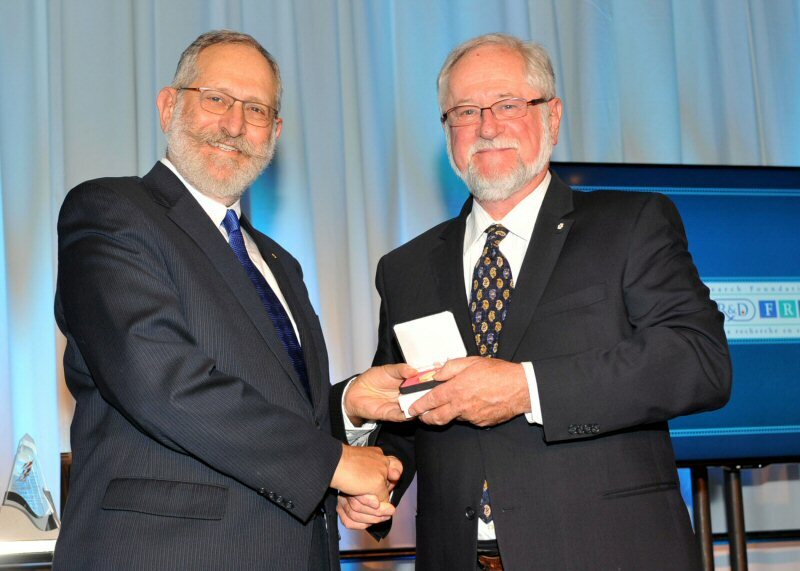 Additionally, the Prix Galien Canada 2014 Research award was given to Dr. Brett Finlay, for his major contributions to microbiology, pharmacology, vaccine development human and animal disease pathogenesis and for transforming our understanding of bacterial interaction with the host cell. The Rx&D Health Research Foundation is a non-profit organization whose mission is to support health research in Canadian academic health centres and promote the value of health research in Canada. By applying the highest standards of scientific excellence, addressing health challenges and establishing partnerships, HRF, one of the leading private health foundations in the country, contributes significantly to the prevention and treatment of disease, to a better health care system and the availability for Canadians to access effective health products. Canada's Research-Based Pharmaceutical Companies is the national association representing the voice of Canada's innovative pharmaceutical industry. We serve our membership by advocating for policies that enable the discovery, development and delivery of innovative medicines and vaccines to improve the lives of all Canadians. We support our memberships' commitment to being a valued partner in the Canadian healthcare system. We represent more than 50 companies investing over $1-billion in R&D annually, fuelling Canada's knowledge-based economy, while contributing over $3-billion overall to Canada's economy. Guided by our Code of Ethical Practices, we work with governments, private payers, healthcare professionals and stakeholders in a highly ethical manner. Research Canada is a national, broad-based alliance dedicated to increasing investments in health research through collaborative advocacy. We believe health research is a shared benefit, shared responsibility and an investment in Canada's future. We engage government, academia, industry and non-profit sectors to build support for balanced and long-term health research funding - investments that strengthen Canada's innovation system and lead to better health, sustainable health care, new commercialization opportunities, and skilled jobs for Canadians. Only through sustained and balanced investments in health research will Canada succeed in keeping its citizens the healthiest and most prosperous in the world.